If anything, the liver is a fitting example of hard work and resilience. It processes everything we eat and drink, including medicine. Even when under the attack of viruses, toxins, and contaminants, it continues to do its job. This organ is essential for our existence, but we tend to be careless about its well-being. Although it’s tough, even the liver can’t resist chronic stress, presenting with symptoms of damage when it’s way too late. Despite major advancements in liver treatment, liver disease cannot be cured, and a liver transplantation is the only option available. This leaves us with just one solution: Avoid liver disease at all costs. Let’s look at some of the things we do every day that can damage our liver. Skipping breakfast. 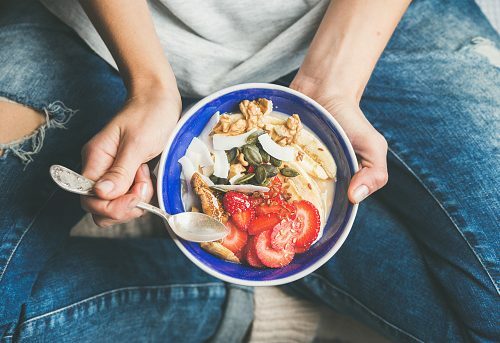 Although breakfast is known as the most important meal of the day, many people tend to skip it. Breakfast-skippers say they have no time for a morning meal or even claim it’s an effort to lose weight. If you’re in a rush in the morning, you can always put a meal together the night before or enjoy a quick breakfast option. If you’re trying to lose weight, not eating breakfast is a bad idea. You will end up really hungry later in the day, leaving you to binge. Why is skipping breakfast bad for your liver? When we wake up, our glucose supply is very low, which impacts the operation of the liver. Make it a habit of eating something quick and nutritious before you leave the house. Sleeping in. Some of us are daytime creatures and some of us are night owls, there’s nothing wrong with that. The problems start when pulling all-nighters or going to bed late (and waking up late) become a habit. In fact, the longer you’ve been a late sleeper, the harder it is to retrain yourself into a new sleeping schedule. Why is it important to go to bed and wake up early? Some of the crucial detoxification processes in the liver take place at specific times at night and when we are in a deep sleep. Avoiding protein. Sufficient protein intake is essential for our overall health, our muscle mass, and healthy weight management. A healthy diet translates into a healthy liver, whereas liver dysfunction is the result of a diet with little nutrients and lots of fats. Even patients suffering from liver cirrhosis are advised to eat protein to support the liver in the process of self-repair. Eating artificially sweetened, processed foods. A big no-no if you want to keep your liver working properly. All the bad stuff in processed foods ends up in the liver. Plus, the fats—found in abundance in these items—tend to accumulate in the abdomen and travel to the liver. The link between obesity and liver disease is well researched, which is yet another reason to watch what you eat. Skipping your first bathroom visit. In the morning, that is. It may seem like common sense to empty your bladder when you get out of bed, but many people don’t. Holding it in is bad for your liver and your kidneys. It takes just a minute, but it can make a big difference to your health. Work on your time management, if needed, and make sure all your bodily needs are taken care of. As you can see, keeping your liver healthy is pretty simple and straightforward. You will benefit from showing your liver some tender loving care, so start your journey towards a healthier you now. Related: What are the early signs of liver damage?